Due to a serious fall, and after hours of paramedic help, I was medevaced to the nearest trauma hospital, Mission Valley Hospital, Mission Viejo, CA, where I spent seven weeks in the hospital. It was also there that I first learned of my epidermoid tumor and the seriousness of my injuries. I was advised to wait until full recovery before looking into the tumor which was only described as benign. Fast forwarding two years, I was diagnosed with simple partial seizures and was referred to Harborview Trauma Medical Center, Seattle WA where I met Dr. Laligam N.Sekhar for a second opinion diagnosis. Because of location, size, and seizure diagnosis, I was recommended for surgery immediately. Facing the pending surgery was a daunting and intimidating task. My fiancé, Ashley, and I moved our wedding to June from September so that we would be married before I had my first craniotomy on July 10, 2012. Thankfully, I have been blessed with a great family, friends, the Epidermoid Brain Tumor Society and a powerful God. Had I not had all of that in my life, I highly doubt I could have stood so strong and determined to get through the obstacles ahead of me. On July 10, 2012 my first surgery came bright and early. As my wife and I entered the hospital, the enormity of what I was about to go through hit me like a wall. Up to and after that point, I tried to be strong, hoping that it would lessen the fears and worries of those that loved and cared for me. With the help of my wife I regained my composure and after meeting my family, I checked into the hospital, waiting to be taken back to get prepped for the operating room. I said my goodbyes and my love, and then Dr. Sekhar arrived and said a pre-surgery prayer with us. The craniotomy took 18 hours, with an 85% tumor removal. I woke up in the recovery room in pain and with my wits about me, giving high-fives to the nurses and warmly greeting my wife and family. I was monitored in the hospital for about 5 days. A 2nd surgery to remove the rest of the tumor was scheduled for July 20th. I was released home where I was cared for by my wife and father. The only chief concern during this time was my right eye which became very swollen. On July 20, 2012 I was again prepped and underwent a 2nd craniotomy. Entrance to brain was in the same way, but stitched my right eye shut so that it would not get any worse. This surgery took about 15-18 hours with the tumor being fully resected. This time my hospitals stay was much longer. A day or so, being stable, I was moved to the recovery floor and given a spinal tap to check the cerebral spinal fluid (CSF) levels. With the help of strong pain medicine and an Avett Brothers’ song sung by my roommate, the first spinal tap went without a hitch. Unfortunately, the CSF levels were found to be more than twice what was normal, and I was informed that I had hydrocephalus. Hydrocephalus is when fluid accumulates in and around the brain creating immense pressure and an incredible, non-stopping terrible pain. I was scheduled to have a shunt implanted into my skull to relieve the pressure and slowly drain out the fluid until it could be kept at a normal, stable level. The passing time leading up to the shunt insertion was by far the worst thing I have experienced up to this point in my life. All I can remember is constantly writhing and crying out for medicine to relieve the intense, crushing pain that I felt in my head. After the shunt was implanted, there was relief. I stayed in the hospital for a couple more weeks and after having my shunt clamped I was given another spinal puncture to check the CSF levels. Thankfully they were found to be normal if not a little above normal and the shunt was removed. Around the same time the stitch closing my eye was also removed, and I was greeted with double vision. Note: If this happens to you after surgery, I strongly recommend getting an eye patch from the hospital or purchasing your own along with a bedazzling kit so you can ‘bling-out’ your eye patch. This not only raises your self-esteem but can also make you look as mean, cool, or nice as you would like to any children that you pass throughout your day. If you are a pirate enthusiast then you are also set! Thankfully after I was released from the hospital my double vision slowly over the course of a few months became occasionally blurred vision. I attribute this to the faithful treatment with the help of ointment, drops, and my bejeweled eye-patch. A few weeks after my release I was cleared to go back to my command where I discovered that I had lost all of the strength and physical abilities that I had pre-surgery. As a Marine this was initially very disheartening as being in-shape despite the injuries I sustained from my fall was something I took much pride in. So, what do I do? I used this to motivate getting back in shape and performing to the best of my abilities at my current command. At my 6 week post-op appointment, the 2nd MRI taken with iodine contrast unlike released MRI showed tumor still. Sweet I thought, just what I need – another surgery. At this time I was also pending a trip to a medical center at Fort Sam Houston, TX where I would receive a leg device to help mobilize me during physical activities. 3rd. surgery was scheduled for right after Christmas after coming back from my medical trip to TX. Well, life has a funny way of changing plans, and while I was down in TX a staph infected my front right sinus causing a goose egg sized lump on fore-head. This made for a very painful plane ride back to Seattle, WA. I grumpily greeted my wife, and off to Harbor-View Trauma Medical Center we went. After being seen by the emergency room I was given medication and had a surgery to clear out the infected area of sinus. It was also determined during this time that the fat tissue placed around the front right sinus had not been closed off completely after the 2nd surgery allowing the tissue to get infected with staph. The wife and I stayed at the hospital through Christmas, and I was discharged just before New Year’s Eve with a central line of continuous anti-biotic to prevent further infection and a rescheduled craniotomy date of January 25, 2013. Craniotomy 3 was finally a success! After a long 10 hour craniotomy, I was once again greeted by my wife and family with my wits still intact and told of a 100% fully resected tumor. We were so relieved. It was a great feeling to finally be free of my moid. Recovery also went without any complications, and I was up and about within a couple of days. The central line was kept in to make sure there would not be a re-occurrence of infection, and after a month it was removed. At my 6 week post-surgery MRI follow-up I received more news. The moid was still alive and well. Fortunately though it was now deemed too small to require surgery, and I was given the wait and watch approach. While it was disconcerting to hear that the moid was still there, I took it in stride. I won’t let it get me down. During my recovery at home I decided to take up cycling. One late night while I was medicated and tired but not quite tired enough to sleep I noted that a friend had sign up for the Seattle to Portland Bike ride. The Seattle to Portland Bicycle Classic, or STP, is an annual one or two-day supported bicycle ride from Seattle, Washington to Portland, Oregon in the United States. 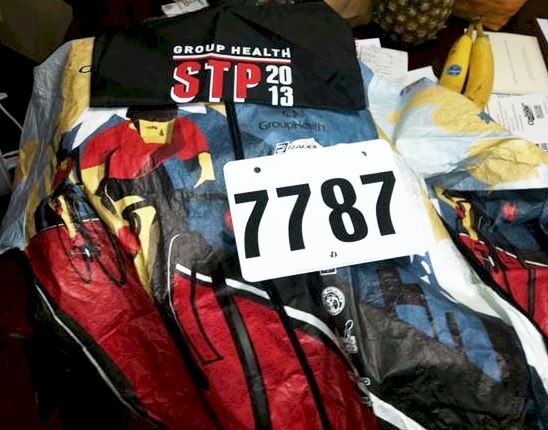 The STP “is considered one of the 10 biggest recreational bicycle rides in the country, drawing riders from across the nation and from other nations”, and has been operating since 1979. It is approximately 202 miles (325 km) in length. 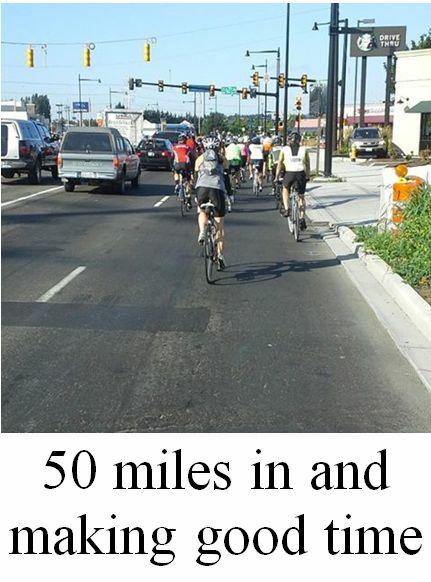 Most riders complete the distance in two days; however, about 10% complete the ride in one day. Now I have never been a cyclist or avid biker but I thought to myself. . .hey, you have a bum leg and some screws loose in the noggin, so just do it.With that, I signed up for the Seattle to Portland ride determined not to let my injuries, limitations, or moid get me down. Thus began my training and preparation for a 202 mile bike adventure. It’s a good day to ride. We aros e at 1:15 a.m. tired and groggy. The excitement of the following day only allowed me to get 3 hours of solid rest that night, but got up and got ready. 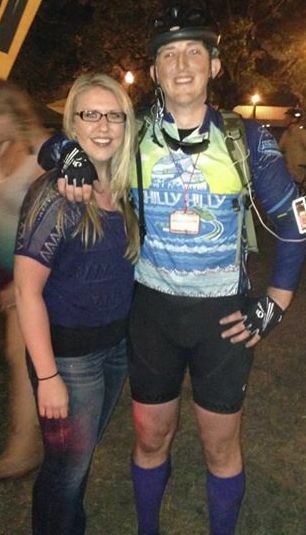 We met our friend who I was riding with and drove to the starting line together with our wives. Trying to contain the adrenaline and keep a cool head was difficult for me. This is it. This is my test, I kept telling myself. At 5:45 a.m. we gave each other a starting fist bump and were off, heading from Seattle to Portland. The morning was brilliant. It was cool yet clear, showing for a bright and sunny day. We rode, getting into a good pace and clearing Seattle, then little towns. 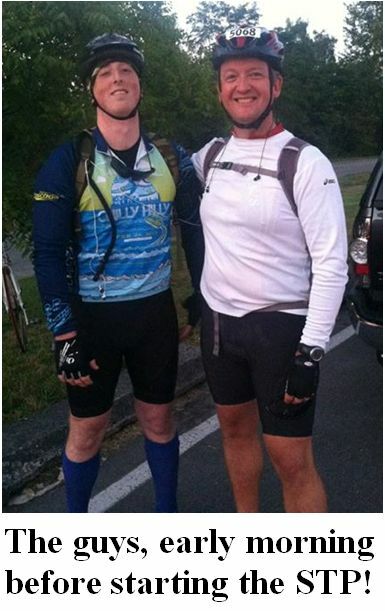 People and volunteers cheered us on along the way and offered up rest stops every 15 to 25 miles along the way. Miles went by, the day grew warmer and we kept pressing on. As I rode, I was pleased and confident in the fact that I had prepared myself properly. We kept on pressing. It is weird how it seems that the last final miles are always the longest. After seven hours of riding we finally came upon the 100 mile half-way point. There we were greeted by our wives and friends who had decided to cheer us on along the way. We stopped and rested, ate and reorganized, refueling our bodies for the daunting next 102 miles of our journey. We took off with gusto, determined to get a good start and try to finish before the official day 1 closing time of the STP. These miles were rougher, tougher, and hillier with rest stops becoming less and less frequent as they started to close with the coming evening. Finally, we reach Portland, and ride through. By this time it was late, and the day was coming to a close. The signs guiding us to our destination were finally in sight. Passersby’s cheered us on saying that it was just a little further up the road. Then we saw our families and friends. Relief and excitement filled our bodies. As we passed through the finish line we gave each other a congratulatory fist bump. Exhausted, sore, and hungry, we got off our bikes and gave great big sweaty hugs our friends and offered up salt covered kisses to our wives. Elated, yet, tired we went to talk and eat; and trying at the same time to not fall asleep were we sat or stood. After food and a beer, we said our good nights to each other. At the hotel after a nice soothing shower, I finally was lying in bed. We had started at 5:45 AM in the morning and finished at 9:40 PM at night. We had done it; I had done it. I set my goal. I overcame my limitations, and I achieved something I would have never thought of had I not had this moid. It was a good day to ride. all strive to keep getting better. 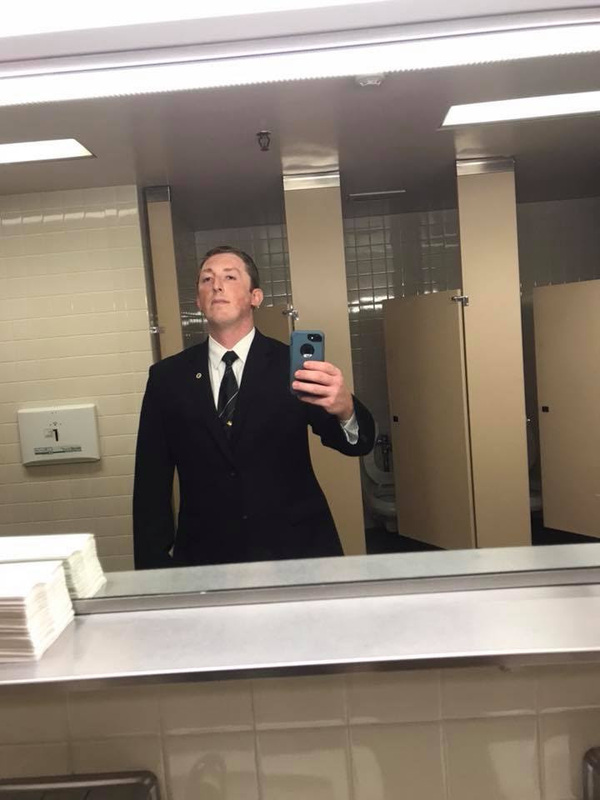 EBTS member, Patrick Roberts is looking sharp on the job for orientation training in Washington, DC. as wounded warrior fellow advocating for veterans on behalf of his congressman in the district where he lives in Texas. Patrick is finishing his degree in Psychology with minors in Criminal Justice and Rehabilitation Services. Patrick is a former Marine and a survivor of the epidermoid brain tumor. Congratulations Patrick Roberts!! We are proud of you! !